This traditional style bed frame has soft curves with the high head end and low foot end, giving it a romantic presence, a truly beautiful centre piece for your bedroom. Elegance with an affordable price. When you buy a Antique Ivory Metal Harper Bed online from Temple & Webster in Australia, we make it as easy as possible for you to find out when your product will be delivered to your home in Melbourne, Sydney or any major city. You can check on a delivery estimate for the By Designs Part #: CHARLOTTE-Q / CHARLOTTE-D / CHARLOTTE-S here. If you have any questions about your purchase or any other Beds product for sale our customer service representatives are available to help.Whether you just want to buy a Antique Ivory Metal Harper Bed or shop for your entire home, Temple & Webster has a zillion things home. This beautiful bed fits perfectly into the room. Very stylish look. Delivery was amazingly quick. 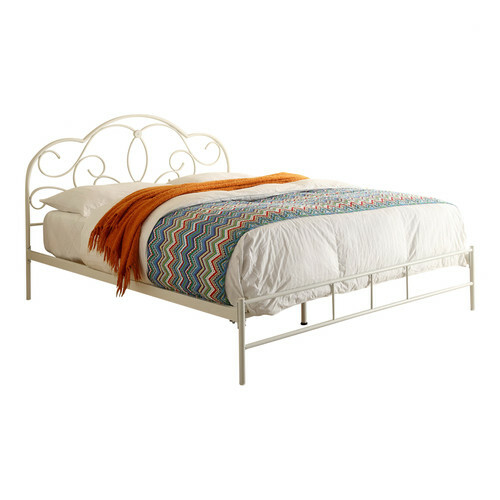 A stylish, affordable bed that was easy to assemble and arrived within two days of ordering. The bed perfectly matched the product I ordered. I have been very happy with my purchase. great bed easy to assemble but need two people ideally. I would certainly buy the same again if I needed one. The Harper bed is well worht buying i had no problems in putting it together. it has transformed my bedroom into a room fit for a queen. Love shopping with Temple&Webster and i look forward to shopping with you again in the new year. This bed ,which needed to be assembled, fitted together like a glove. Looks delightful. Had a great night sleep.